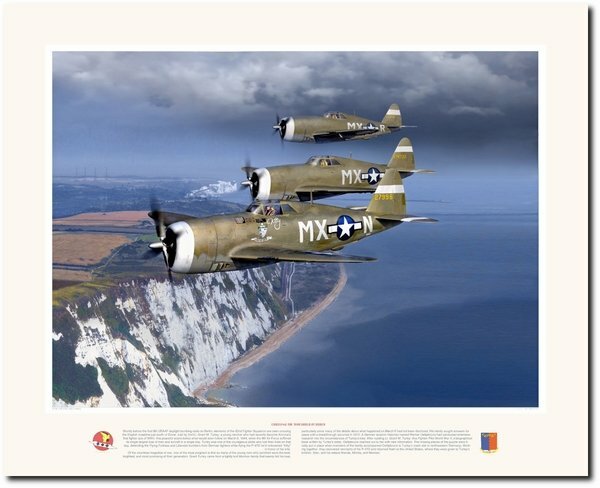 Shortly before the first 8th USAAF daylight bombing raids on Berlin, elements of the 82nd Fighter Squadron are seen crossing the English coastline just south of Dover. Led by 2nd Lt. Grant M. Turley, a young rancher who had recently become Arizona’s first fighter ace of WWII, this peaceful scene belies what would soon follow on March 6, 1944, when the 8th Air Force suffered its single largest loss of men and aircraft in a single day. Turley was one of the courageous pilots who lost their lives on that day, defending the Flying Fortress and Liberator bombers from German fighters while flying the P-47D he’d nicknamed “Kitty” in honor of his wife. Of the countless tragedies of war, one of the most poignant is that so many of the young men who perished were the best, brightest, and most promising of their generation. Grant Turley came from a tightly knit Mormon family that keenly felt his loss, particularly since many of the details about what happened on March 6 had not been disclosed. His family sought answers for years until a breakthrough occurred in 2012. A German aviation historian named Werner Oeltjebruns had conducted extensive research into the circumstances of Turley’s loss. After reading Lt. Grant M. Turley: Ace Fighter Pilot World War II, a biographical book written by Turley’s sister, Oeltjebruns reached out to her with new information. The missing pieces of the puzzle were finally put in place when members of the family accompanied Oeltjebruns to Turley’s crash site in northwestern Germany. Working together, they recovered remnants of his P-47D and returned them to the United States, where they were given to Turley’s brother, Stan, and his sisters Wanda, Monita, and Mennen.